Where to begin? Bob Dylan just gave one of the most in-depth interviews he’s done in at least three decades, and it’s fantastic. It’s a full 8,200 words, and was posted to his website. The interviewer–writer, MTV editorial director, and CBS Sunday Morning contributor Bill Flanagan–leads Dylan past and forth from his recent work interpreting American standards, to his early days as a boy first hearing surf rock in the Twin Cities, to some of the most pivotal moments of his career. They talked about everything from Amy Winehouse (of whom Dylan was a fan), to “Wagon Wheel” (which, if you didn’t know, he mostly wrote), to hanging out with Frank Sinatra and Ornette Coleman, to why Dylan elects to sing “badly” sometimes even though he, as many of these standards recordings reveal, can croon quite beautifully. I’ve humbly deigned to select some of the best passages from the sprawling Q&A below. 10. Dylan reveals what he watches on his tourbus. Yeah, OK. No, I don’t remember writing any of those songs. They were found in an old trunk which came out of what people called the Big Pink house in Woodstock,mostly lyrics left over when we were recording all those Basement Tapes songs. 7. A bunch of Bob Dylan songs, apparently, are influenced by Biblical epics from the ’40s and ’50s. 6. Dylan describes Amy Winehouse. 5. Dylan discusses his friendship with Ornette Coleman, and why he felt an affinity with the free-jazz icon. 4. Dylan speaks eloquently about his love of the American Songbook, and what he says to people who criticize him for recording standards. 3. 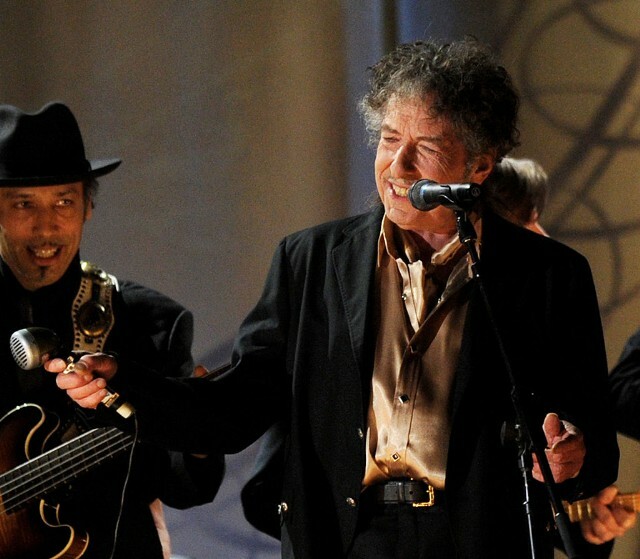 Dylan remembers the most important of the several times he met Frank Sinatra. 1. Dylan says this beautiful thing about the allusion of “original” creativity. …most everything is a knockoff of something else. You could have some monstrous vision, or a perplexing idea that you can’t quite get down, can’t handle the theme. But then you’ll see a newspaper clipping or a billboard sign, or a paragraph from an old Dickens novel, or you’ll hear some line from another song, or something you might overhear somebody say just might be something in your mind that you didn’t know you remembered. That will give you the point of approach and specific details. It’s like you’re sleepwalking, not searching or seeking; things are transmitted to you. It’s as if you were looking at something far off and now you’re standing in the middle of it. Once you get the idea, everything you see, read, taste or smell becomes an allusion to it. It’s the art of transforming things. You don’t really serve art, art serves you and it’s only an expression of life anyway; it’s not real life. It’s tricky, you have to have the right touch and integrity or you could end up with something stupid. Michelangelo’s statue of David is not the real David. Some people never get this and they’re left outside in the dark. Try to create something original, you’re in for a surprise. Believe it or not, this is far from the full interview. Do yourself a favor and read the rest at BobDylan.com. Also, Dylan’s new triple-LP of American Songbook selections is out on March 31, and selections from the album are streaming now via NPR.